The Classic Period of Maya art and architecture was between 250 – 900 AD. This includes Copan’s Golden Age: 420 – 820 AD. 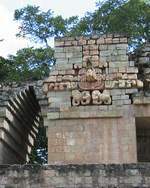 Sixteen rulers guided the fortunes of Copan’s citizens for those 400 years. The massive architecture and refined beauty of the carved stone monuments leaves us a reminder of the greatness of these ancient Americans. • UNESCO World Heritage Site designation in 1980. Rich Culture in a Poor Land: The extensive ancient city moved renowned 19th Century English archaeologist Sylvanus Morley to describe Copan as “the Athens of the New World”, but in a modern country where per capita income is $810 a year, it is difficult to find the resources to protect and research Copan’s unique architecture, sculpture, and artifacts.